Exodus Redux Kodi addon: Is it safe to install? Are there alternatives? Looking for information on the Exodus Redux Kodi addon? In this article, we will explore how safe this addon is, how its content is streamed, and any possible alternatives. Kodi is an open source media player. It has many features, such as letting you play media from online sources and local storage. It’s available for a wide range of devices such as the Amazon Fire TV and Fire Stick, iPhones and iPads, and the Nvidia Shield. Kodi version 18 Leia is currently available for download. VPNs can mask your identity online by routing your internet connection through secure servers, protecting your online activity and identity. This is necessary these days since ISPs can view your streaming activity (all of it) and can even share this information with third parties for their profit. In addition, ISPs have a history of throttling the connection speeds of users who stream video content. However, using a VPN makes it impossible for your ISP to find out if you’re streaming video or not, ultimately letting you stream as much as you want and HD or 4K. Another important point to consider is the protection that VPNs offer against connection hacking, like man-in-the-middle (MitM) attacks. Moreover, a VPN can help you bypass geographic content restrictions often imposed by some services. We have tested several VPNs and recommend IPVanish for use with Kodi. It provides secure, fast connection speeds, and is compatible with a variety of devices ranging from iOS devices and Android devices to Windows and Linux computers. READER DEAL: Save 60% on an IPVanish annual plan here. IPVanish has a seven-day money back guarantee so you can try it risk-free. What is Exodus Redux? Should you install this Kodi addon? Exodus Redux is a fork of the once popular Exodus Kodi addon. It provides links to a large selection of movies and TV shows. It also comes with a search function and integration with a few other services like Trakt. While the content and interface it provides are eye-catching, you should note that its streaming method is accomplished primarily through pirated content websites. These are illegal in many countries, including the UK and Australia, while they’re in an illicit gray area in many other countries. For this reason, we don’t recommend using this addon. Instead, we suggest that you consider some official alternatives that offer a wealth of free and legal content. 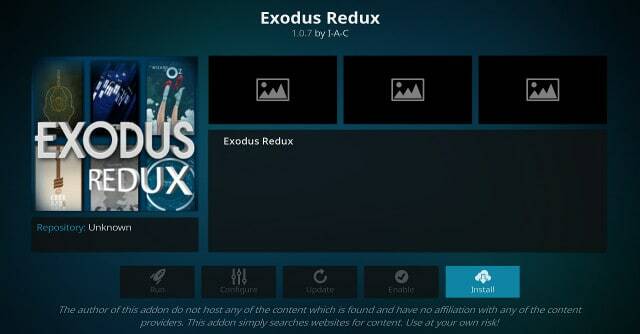 Exodus Redux is a third-party addon which doesn’t serve up content officially. There are also other instances where third-party addons have been harmful due to malicious developers. Some notable and recent examples include the popular Gaia and Bubbles addons, which installed cryptocurrency mining malware on users’ devices without consent. While you should be careful, note that most third-party addons are harmless. If you are downloading a third-party addon, check to see if it provides legal content streams. A good way to spot this is to examine the content providers listed in the addon’s settings, and the type of content offered. If all you see are the latest and greatest films and shows, including many of which are still in the theaters or normally available through paid streaming services like Netflix, then the addon is probably infringing copyright laws. Official addons are subjected to more stringent guidelines and are a valid option for accessing high-quality content which complies with copyright laws. Furthermore, many addons provide this content at competitive pricing or even for free. Take a look at our suggested Exodus Redux addons below. Tubi TV gives users access to thousands of entertaining titles. The best part is that it’s all free. This is because the service is ad-supported. 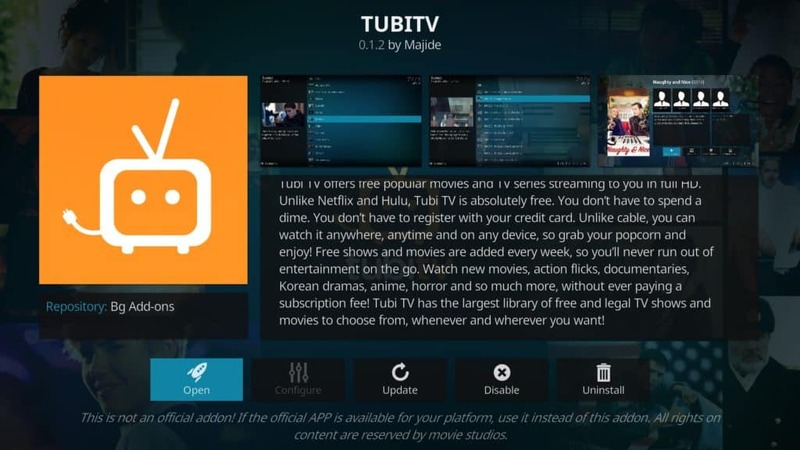 If you use the official Tubi TV Kodi addon, however, Kodi will filter out the ads completely. While there is some B- and C-level content available, you will find many movies and TV shows with decent IMDb and Rotten Tomatoes ratings. Tubi TV even has a “Highly Rated on Rotten Tomatoes” section with dozens of titles. You also won’t be limited to just older titles and some of them are even available in HD. You can find movies such as Bloodlines from 2018, and Deadly Sanctuary from 2016, as well as TV shows like Crash and Bushido Man. Content spans many categories such as Sci-fi & Fantasy, Comedy, Classics. In addition to being available as a Kodi addon, it is also available natively on the Roku, Amazon Fire TV and Firestick, Samsung Smart TVs, and the 4th generation Apple TV. While there is lots of content available, some of it is restricted to certain geographic locations. Some content libraries are restricted to the US, Canada, and the UK. However, if you wish to unlock the entire Tubi TV library (over 50,000 TV show episodes and movies), you can use a VPN to bypass the service’s geographic blocks. 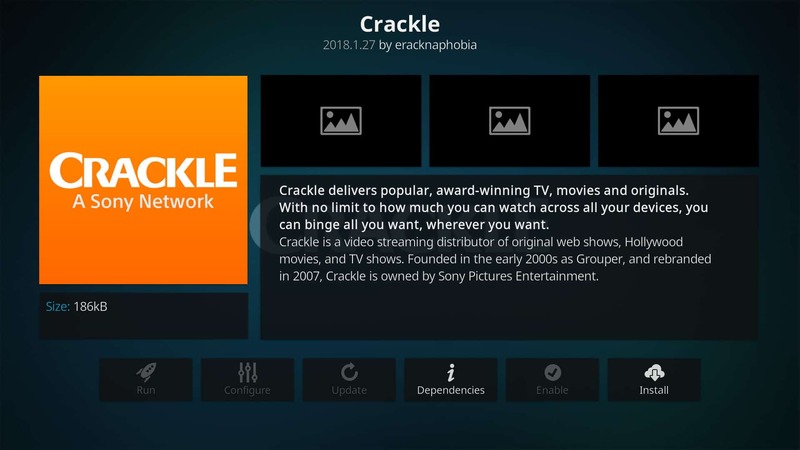 Similar to Tubi TV, Crackle is a free VOD service by Sony. It’s also ad-supported but if you watch it using the Crackle Kodi addon, the ads will be filtered out. There is a good mix of older and newer titles that users can view with Crackle. Movies such as Spiderman and Friends With Benefits can be found. TV series such as Seinfeld, Walker Texas Ranger (with Chuck Norris) and Men at Work can be streamed too. 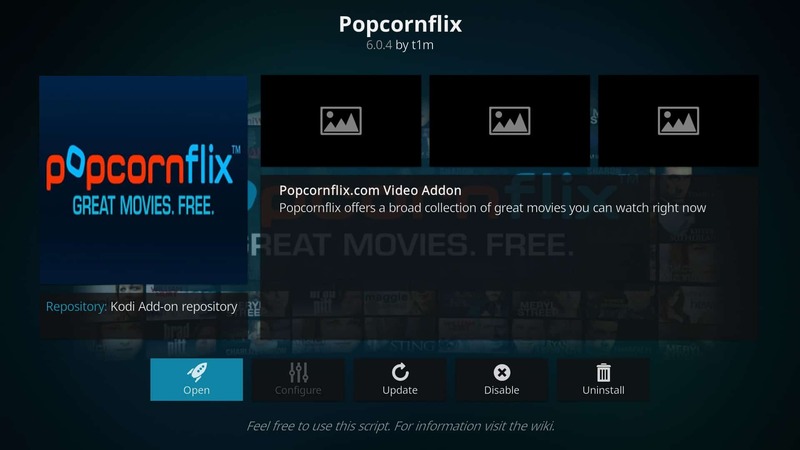 Popcornflix is an ad-supported streaming TV service which is mainly focused on movies and TV shows. If you use the platform’s service through the Kodi addon then you will not have to worry about the ads since Kodi will filter them out. There are some B- and C-list content present but you will also find top quality movies like The Last Airbender and Tactical Force. You can also find TV shows such as Detectorists and Chicken Soup for the Soul. Currently, Popcornflix is only available in Canada and the US. However, you can bypass this geographical restriction by connecting to a VPN server in one of these countries. You will find in excess of 100 live channels on Xumo, as well as on-demand content across categories such as Drink & Travel and Fashion. You can access this ad-supported service through the Xumo.tv Kodi addon. You will find channels such as The GrapeVine and Gravitas Movies on Xumo. Generally, on-demand content usually accompanies a channel. 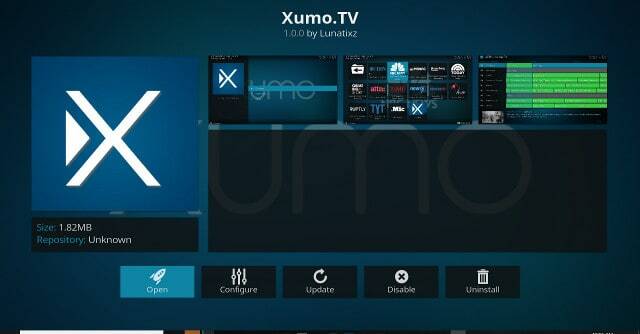 Xumo is currently only available in the US. This means that if you’re outside of the US you will have to connect to a US VPN server in order to use the service. Pluto.tv offers up a large collection of TV channels, similarly to Xumo. This is yet another ad-supported service which you can access as a Kodi addon. Channels such as Cracked and The Asylum are available. You can browse content using the channel guide, via individual channels, and you can browse on-demand content. You will find channels such as the Action Movies channel as well as the Classic Movies channel. 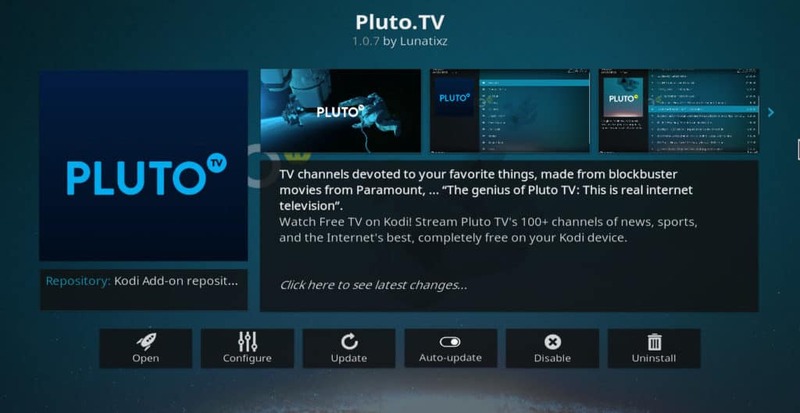 In addition to the Kodi addon, Pluto is available for iOS devices, Android devices, the Google Chromecast as a Chrome web app, on Amazon tablets, and on the Apple TV. The Pluto.tv Kodi addon is available from the official Kodi addon repository. USTVnow is a streaming TV service with both free and paid packages. The free package gives users access to ABC, CBS, CW, FOX, NBC, PBS and My 9. If you have Kodi, you can access the service through the USTVnow Plus Kodi addon. In order to access more TV channels, you will have to upgrade to a paid package. Movies are available for rent as well. The USTVnow Plus Kodi addon is available from the official Kodi addon repository. Viewster is a free ad-supported service which allows you to stream TV shows and movies worldwide. 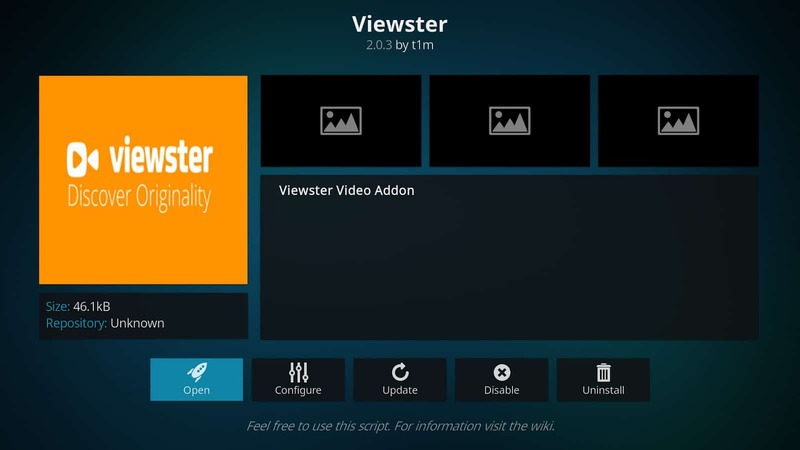 Its content can be accessed through the Viewster Kodi addon. You won’t find the latest and greatest content on Viewster but you can find shows like From the New World and Dallas. You can also find movies such as Buddha and Born to Win. 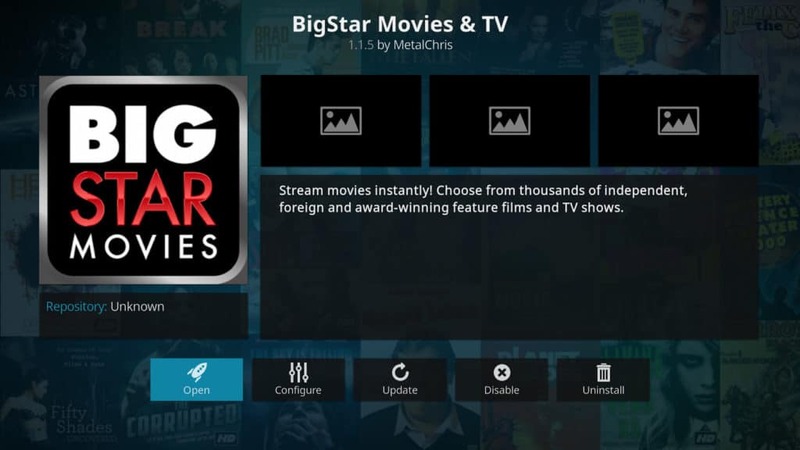 Big Star Movies is yet another streaming platform with content available directly through a Kodi addon. There aren’t many mainstream titles available for it but you can still enjoy TV shows like The Inbetweeners and movies like The Iron Ivan, and Surf Party (National Lampoon’s). There seems to be a wide variety of documentaries and there is some animated content available such as Street Fighter: The New Challengers. 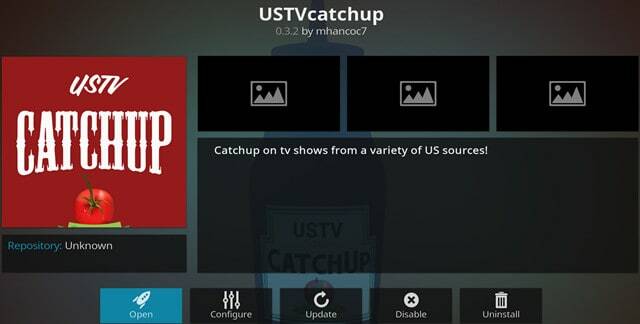 USTVCatchup offers previously-aired episodes of TV shows from networks in the US. This free Kodi addon lets users access shows such as Hot Mess and Reba from NBC. You can also find shows from networks like Freeform and HGTV. USTVCatchup is available from the TVADDONS.CO addon repository. Exodus Redux certainly has an enviable amount of content. However, the way in which content is provided through this addon infringes on copyright rules. It is therefore not advisable to use this addon. Instead, consider addons such as TubiTV, Crackle, Xumo and Pluto.tv. These addons have modern, high-quality content and are free to use. Even if one addon doesn’t satisfy all of your content needs, a combination of these addons could fill some of the gaps. The other alternative addons reviewed, such as USTVCatchup, are by no means lesser options. They tend to contain less content than TubiTV, Crackle, Xumo, or Pluto.tv but they usually focus on something specific. USTVCatchup only focuses on a few channels like Food Network and DIY Network for example, and USTVNow is mostly a live TV-oriented service. Take your pick based on your content needs, but as you can see there is a wide range of addons for you to safely and legally stream content. 3 What is Exodus Redux? Should you install this Kodi addon?